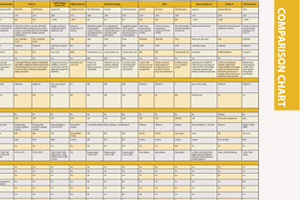 This article orignally ran as an introduction to the Enterprise Imaging comparison chart. You can view the chart here. Enterprise imaging as a concept has been around for several years, but many organizations are just turning their full attention to it now, according to Jef Williams, managing partner at Paragon Consulting Partners. This is because other health information technology (IT) endeavors have taken precedence, including electronic medical records (EMRs) and Meaningful Use. Now, as enterprise imaging comes to the forefront, Williams and other speakers at the 2016 annual meeting of the Association for Medical Imaging Management (AHRA) discussed the importance of having an enterprise imaging strategy and how to implement it. Watch the VIDEO "Six Tenets of Enterprise Imaging Strategy," and interview with Jef Williams, managing partner, Paragon Consulting Partners, on the essential elements of building an enterprise imaging strategy, at the 2016 Association for Medical Imaging Management (AHRA) annual meeting. Watch the VIDEO "Creating an Enterprise Imaging System," an interview with Kim Garriott, principal consultant, Logicalis Inc., and Jef Williams, COO Ascendian Healthcare Consulting, explaining details of how to create an enterprise imaging system at the Radiological Society of North America (RSNA) 2015 meeting. Williams and Kim Garriott, principal consultant for healthcare strategies at Logicalis, spoke to AHRA attendees about the six basic tenets of any enterprise imaging strategy. Governance. The first step in establishing an enterprise imaging strategy, according to Williams, is creating a governing council to oversee the initiative from start to finish. This will require collaboration among team members from different departments who may have different needs and workflows, which can make compromise difficult. The people chosen must have authority from the top to decide how best to proceed and how to educate the rest of the staff, because they will be making some hard decisions. These individuals must be identified as early as possible to help the multi-year project go smoothly. Hardware, software and systems management. When assessing an organization’s technical capabilities for enterprise imaging, it may appear that much of the existing infrastructure is already in place, with various picture archiving and communication systems (PACS), vendor neutral archives (VNA), and other hardware and software already running. It comes down to a decision about whether to take a best-of-suite approach (employing all solutions from a single vendor) or a best-of-breed approach (patching together solutions from multiple vendors) to enterprise imaging. Image acquisition and workflow. Coordinating workflows can be a challenge in implementing enterprise imaging because workflows can vary greatly from one department to another. Radiology has always operated on a system of orders-based image acquisition, where images are not taken until they are ordered by another physician. Nearly every other medical discipline, however, operates on a system of encounters-based acquisition where imaging is a secondary task performed during a clinic visit or procedure. Mobile devices add a new dimension to encounter-based acquisition, raising numerous privacy and safety questions about the data gathered. The ultimate goal is to streamline the image acquisition process as much as possible, and only display clinically relevant images in the EMR. Williams said it is also important to standardize naming conventions and ensure appropriate metadata assignment. Access and visualization. Mobile devices also complicate decisions about who can access images in the EMR, as well as where, when and how they can do it. Mobile devices add another wrinkle here, as they make it easy for physicians to share images and consult with each other in non-HIPAA-compliant fashion. Garriott noted that many vendors do offer U.S. Food and Drug Administration (FDA)-approved diagnostic, zero-footprint viewers for numerous devices. Using these viewers, image data either never makes it onto the device at all, or is automatically removed as soon as the clinician is finished with it. Image exchange and sharing. Most providers have some sort of technology to facilitate image sharing, at least within their own network. In order to share images outside of the network, however, many providers are still loading images onto CDs and relying on the patient to transport them to any other healthcare providers they visit. The challenge, according to Williams, is working out the electronic permissions to allow out-of-network providers to have access to your image archive. He added that implementing electronic image sharing functionality will increase both physician and patient satisfaction, enhance clinical collaboration and reduce costs. Data analytics. This step focuses on how to digest and organize the cornucopia of patient data providers will suddenly have at their fingertips once the enterprise imaging strategy is fully implemented. Employing an enterprise content management (ECM) system to parse the information, users will be able to track a variety of metrics for both clinical (outcomes, dose, quality, etc.) and operational metrics (exam turnaround times, resource utilization, staff scheduling, etc.). The key, according to Williams, is knowing what specific question you are trying to answer and targeting the data to help arrive at a conclusion.